With the holidays quickly approaching, it will only be a matter of time before your office hosts its annual holiday gift exchange. 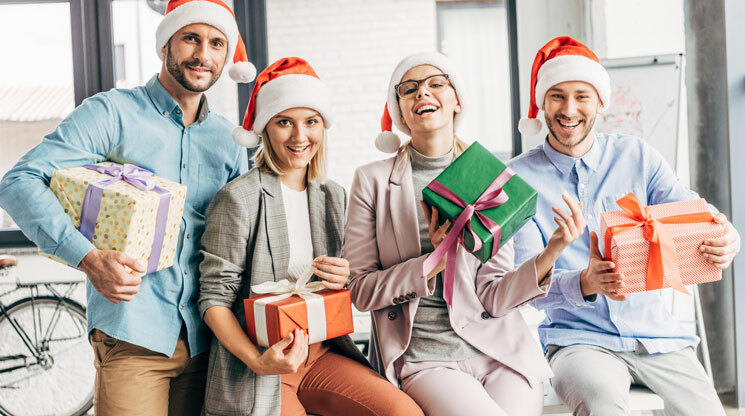 Whether you are giving gifts to a specific person, or having a random grab bag, giving gifts to your coworkers can help build healthy relationships. If you are struggling to find a suitable gift for an upcoming gift exchange, check out some of these gift ideas. These items are relatively cheap, so don’t fret if there is a price limit. Do you know some people in the office who have been stressed out from work this year? If so, consider buying some gifts that can help them lower their stress levels over the holidays. Stress relievers come in many shapes and sizes, but they are all designed with one purpose: to help people relax. Some good options include desk Zen gardens, bonsai trees, and coloring books. These items are usually inexpensive, so price limits should not pose any issues. Treats of any kind make excellent holiday gifts. Many different types of chocolates, candies, and cookies are sold around the holidays, and they can please any coworker. If you like to bake, you should ask if you can make your own confections to give at the gift exchange. You can even include the recipe so the person who gets the gift can make it themselves. If you are doing a random gift exchange, make sure to be aware of any coworkers who have allergies. It would be wise to get treats that anyone in the office can eat, to avoid problems. Card and board games can also make fun gifts for your coworkers. From trivia to dice games, there are many different games you can buy. There are many options under $20 available to purchase, so if you can only spend a certain amount of money on gifts, there shouldn’t be any problems. Card games in particular make great gifts because you can play them at your holiday party to help liven the mood. Mugs are among the most common gifts offered at office gift exchanges. They are cheap, easy-to-find, and are helpful for office workers who like to have coffee or tea in the morning. Instead of giving a generic mug, consider purchasing one with a funny design or saying on it. Know someone who’s really hard to talk to in the morning? Look for a coffee mug that playfully pokes fun at this fact. Everyone in the room will have a good laugh, and the gift receiver will have a practical item to use in the morning.